When you’ve made stock, don’t forget to fish out the soup bones and pick the meat off them. As long as no salt was added, soup meat is perfect for cats. Cut the meat in small pieces, and steep a slice of whole wheat bread in a few tablespoons broth. Mash the bread with a fork and mix with the meat. Or use some leftover cooked rice. Cats love it when their food is still lukewarm. If you have prepared chicken stock, you can also use the chicken skin. That is fat, but once in a while won’t harm your cat. Just one thing, always check the meat carefully and remove any small bones or gristle. Some cats like very strange food. Meat, fish and dairy products are to be expected, but the cat of a friend of my daughter loves broccoli, and I had one that nibbled brussels sprouts! And speaking of strange tastes: I once discovered the layer of a mouse in an unused closet where the occupant had collected a large amount of cat food, straight from the feeding bowls of my cats. And this is new for me: Hiro and Micah spurn canned cat food, they only eat dry food. Willingly. Except when they happen to see City devouring his canned food, then they suddenly want it too. A tip: if you ever feed your cats ‘human food’, NEVER give it straight from the table. Always present the food at their usual feeding spot, preferably at a fixed moment. Not when cats ask for it. Unless ofcourse it happens to be their feeding time. Our senior cat can tell the time perfectly, from a quarter to six in the evening he makes you trip over him wherever you go until his dinner is served. Below a little video I made on April 16, 2013 of City and Micah playing or fighting for dominance, I’m not sure which. They do not use their claws, so I think it’s alright! While visiting this site you may have encountered pictures of food with cats. Those are my cats, Since June 2015 I have one cat left, Hiro. To my surprise, he developed from a very shy cat which hardly ever sought attention, to a very affectionate cat with a loud purr. He still avoids strangers. Because he seems to thrive on being ‘an only cat’, there will be no second cat. Cats are just like humans: no two alike. They are very decisive in their likes and hates of foodstuff (and people). Everybody thinks his or her own cat (or dog) is unique, and I am no exception. So therefore I present you with descriptions of all the Coquinaria Cats. 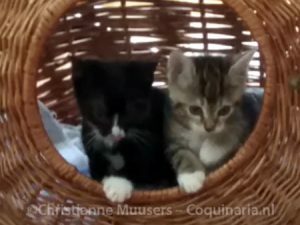 Since 9 April 2018 there are no Coquinaria cats. For 22 years there was always a cat around to take a share from the many culinary experiments. It is very strange, and sad. City (1996-2015) was our first cat, and he survived several ‘second cats’. When my daughter was three years old, a friend of hers had a cat with a litter. When I picked her up, she told me: “I will have the red one”. So then we had a cat. City ate everything, including the food of the other cats. 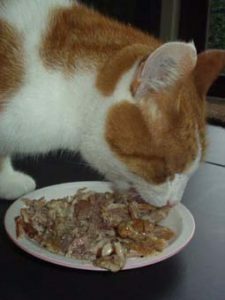 His favourite food was chicken meat, cheese (preferably old Gouda cheese or Parmesan) and salmon or tuna, raw or canned. He was not pleased with our move to Kortenhoef in 2007. He kept walking back to our old house in another city, a walk of several kilometers through woodland and across at least two very busy roads. Whatever I tried, from pheromones to an animal behaviour therapist, nothing helped. 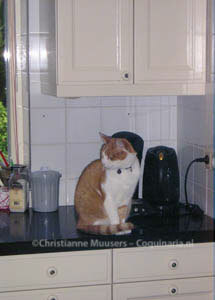 Each time I collected him in Hilversum when my former neighbour had spotted him. But he was always glad to see us and would be happy for a few days, until the urge hit again. One time things went horribly wrong, in 2012. He was gone for five weeks before the animal rescue service found him on the other side of town. He could be identified by the chip that was placed under his skin. He was just a bag of bones, and had apparently hardly eaten at all. Probably he had crawled into the van of a gardener or handyman and escaped from the car at the other side of Hilversum. The last time he left for Hilversum was in October 2014, four months before he died. I have tried to calculate how many kilometers I have driven over the course of seven years to collect him in Hilversum. It was over a thousand (622 miles). City and Hiro disliked each other, but Micah was tolerated by the old cat. His best friend had been Poesjenel. On 9 February 2015 City died, after a long life filled with adventures and love. We buried him next to Poesjenel in the garden of our old home in Hilversum. My calico she-cat was named Poesjenel (1997-2005). Her mother was a wild stray cat that was caught to be sterilized, but she was already pregnant. Poesjenel was a real diary cat; she loved butter, cheese, cream, yoghurt. She’d have a nibble of freshly cooked meat or fish, but given a choice, she preferred canned cat food. Poesjenel was named after a pussycat from a Dutch children’s verse. She loved to play with small beads and rubber bands (preferably pink, a real girl, and I am NOT making this up!). When she finished playing with them she deposited them very tidily in her tray with dry cat food. She then ate around them. She was very affectionate to those she knows, but easily scared. I think that is because the first six weeks of her life were spent with her wild mother in a cage at the vet’s. The mother was released after her kittens were weaned, she was too wild to be domesticated. One of her great charms was that she could ‘talk’. She always answered back when you addressed her, and had a whole repertoire of meows and mewls to convey her meaning on things. 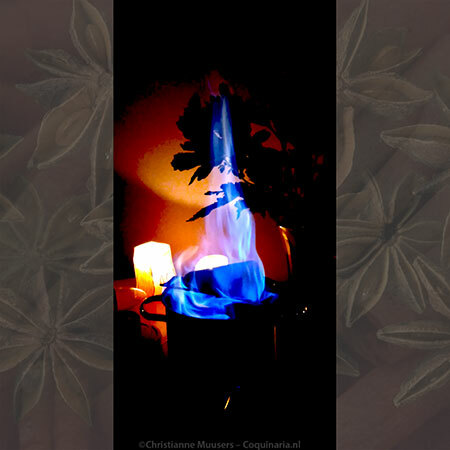 To our great sadness Poesjenel died suddenly on November 14, 2005. She was only eight years old. From a culinary point of view Betje (1985-2006) is not very interesting. When she came to live with us, she was already twenty years old. She had deficient kidneys, needing to drink a lot of water, and she had to eat diet food. The vet advised against giving her fresh meat, too much protein was bad for her. But she quite enjoyed her diet food and senior cat food. Once in a while Betje was treated to a small spoonful of liver paté. The vet had told me a trick to make sure she swallowed the antibiotics she needed when she was ill: roll two little balls (size: teaspoon) of the liver paté. In one them you hide the pill. First you offer the ball without the pill, then the other. That worked excellently. She was soon off antibiotics, but I still occasionally treated her with a little spoonful of liver paté. Betje had been an outdoor cat during her whole life. But when she came to live with us and finally had her own cushion in a warm home she apparently decided to never, ever set a paw outside again. Sometimes, when the weather was good, I tried to lure her out into the sunshine. When she was awake she often followed me around. So I would just walk through the kitchen door into the garden, and Betje followed me step by hesitating step, until she reached the threshold. Then she stopped walking, glinted suspiciously at the green grass, and resolutely turned around. She really has had it with outdoor life. Betje passed away peacefully on April 5, 2006. See this LJ-Post. Clio (2005-2008) arrived at our home a few weeks after Poesjenel died. She was almost nine weeks old when we took her in, and after two days of adjusting everything a kitten should be: lively, curious, naughty, affectionate, playful. For daily food I gave her “junior” dried food and canned food. I can understand the reason behind special junior dried food: the chunks are smaller and not as crunchy as those for big cats, but with regards to canned junior cat food I wonder whether I was not just buying a clever marketing trick. Fact is that not only Clio loved her juniorfood, City and even Betje loved it too. To prevent Betje from eating Clio’s food it was enough to put it somewhere a little higher because Betje can’t climb or jump anymore. But I really had to keep an eye on hog City. Clio was the most relaxed cat of all my cats. I could pick her up and put her on my lap and she would remain there exactly as I had put her. 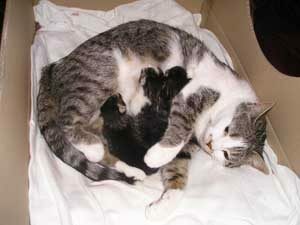 When Clio was two years old, in 2007, she was allowed to have kittens before the vet sterilized her. She was in heat during the last week of August (see post on LJ), and two months later she became the proud mother of three kittens, all male. The fathers (because a female cat can be impregnated by more than one male at the same time) are cool tomcats from Kortenhoef. 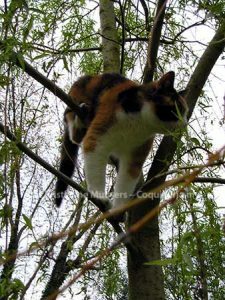 Clio turned into a svelte, elegant cat, and she wasa very good huntress. She was also a very patient mother. The kitten that we kept, Hiro, was still allowed to drink when it was ten months old. But that came to an abrupt end when Clio was hit by a car, two weeks before her third birthday. I am grateful to the person who took the trouble to call the animal ambulance (‘dierenambulance’, the equivalent of ‘animal rescue team’?). At least we know what happened to her. Again, thanks to the chip that was placed under her skin. The only cat born into our household is Hiro (2007). According to the vet, he is the son of a Norwegian Forest Cat. 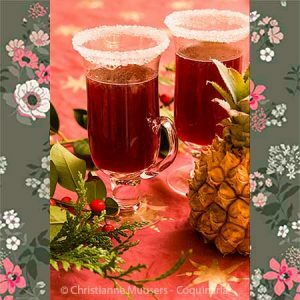 Mother Clio has been carousing in good circles! He was the firstborn of the litter, and was stuck for almost four hours in the birth channel. And he had something strange: after seven weeks the whiskers just dissappeared, and we never found out why. Luckily they are growing back, because a whiskerless cat is slightly handicapped. Someone emailed me that maybe the mother had bitten the whiskers off because they irritated her skin when he was feeding from her. Hiro is extremely interested in our food, so he has to be taught to only eat from his OWN plate. He’s the first cat that is also interested in anything we happen to drink. When he gets the chance he dives his nose into any glass or cup to take a sniff and a taste, often emerging spitting and snorting. But his own water supply is a playground for him. He likes to stand with his two front paws in the water and splash it around. And just like Poesjenel a few years ago, he loves dairy products, especially yoghurt. Hiro was named after the Japanese hero from the American action series Heroes. 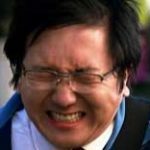 My daughter thought she saw a resemblance between Hiro Nakamura and the newborn kitten. Another picture of Hiro. Hiro is a hunter, like is mother. But our new environment has different prey to offer. In April and May he dragged may bugs through the cat flap, to play football with them. I saved the dizzy insects and put them back outside. After the may bugs, he concentrated on frogs. At first I thought he had killed them, but these clammy animals just ‘played dead’ so that he would lose interest. These I picked up and threw back in the garden pond, where they swam to the bottom as quickly as possible. Hiro kept challenging our oldest cat City since he was a kitten. They never became friends. But Hiro was great buddies with Micah. In the beginning of April 2018 Hiro was diagnosed with a heart disease and metastatic lung cancer. The prognosis was somewhere between within an hour and a year. We decided to enjoy him as long as possible. But that was not very long. Within five days we had to decide to euthanize him, he was in too much pain and very short of breath. It was also impossible to give him any medication, and using force caused too much stress. He was always very stubborn. 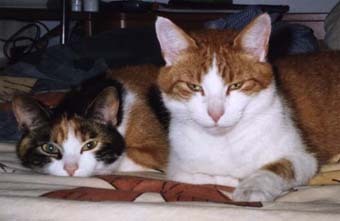 The brothers of Hiro are Mortje and Manje (2007). When they were nine weeks old they moved in with a friend of mine. They love their new home and human. She lives at the edge of Hilversum, with lots of meadows behind the house that provide a great hunting-ground for them. And they love to hunt! I get regular updates on the latest prey they’ve dragged inside the house (anything from doves to a big crayfish). Occasionally I catsit them, when my friend is away on holiday. In the picture the kittens were nine weeks old. To the left are Mortje and Manje, Hiro is on the right side. Manje resembles his mother. 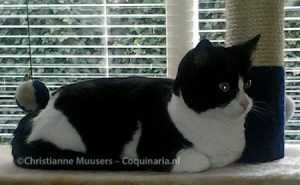 Hiro and Mortje are clearly brothers, but Mortje has four white socks and a white pointed tail. Micah (2008-2015) arrived in our home a few weeks after Clio’s death, when he was ten weeks old. Of course we love to have a new kitten in the house, but it’s for Hiro that we did it! The little cat was offered us as a female, but when we were so impolite to glance under its tail after a few days, ‘she’ appeared to be a ‘he’. The vet agreed with us, and told us he had eastern ancestry (Siamese). Our kitten would grow into a bloody-minded, pig-headed, but affectionate and communicative cat. It took only a week for Micah and Hiro to become fast friends. And he even managed to strike up a cautious friendship with City. Micah seemed to copy his ‘big brother’ Hiro in matters of food: he loves yoghurt. He almost doubled in weight in four weeks’ time, and is very, very active. Micah developed into a beautiful, friendly but assertive cat, exactly as the vet had predicted. 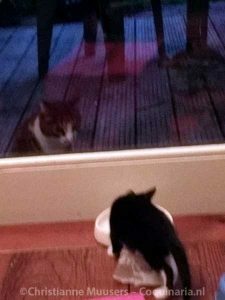 Whenever our other cats just looked at feline visitors from a distance, he walked up to them with a swagger. And … the other cats walked away. Micah was Topcat. In June 2015 Micah was hit by a car, just like hapenned with Clio some years before. We miss his bright eyers, his very loud purring, and his paw that he held up just like a Japanese good-luck cat when he wanted attention. We also call them cats 2.0. A few weeks after Hiro had suddenly died, a good friend of mine told me that the mother of her two cats was again expecting. 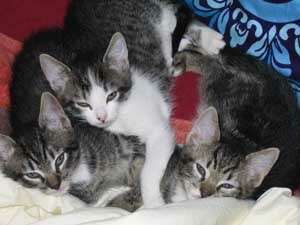 The litter consisted of three tomcats and one female. Although I did not plan to start with new cats so soon, the house felt very empty after living 22 years with at least one cat. Sometimes things are meant to be. The dark kitten is a female, Luna, the light one is called Milo. They were born on 1 May 2018. In the picture they are about to leave the travelling basket to discover their new home. When we visited the vet for their first inoculation, Milo was discovered to be a female also. But she will remain ‘Milo’, it seems that it can also be used for females. And we heard that another kitten from the litter was also discovered to be female. 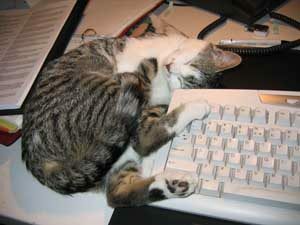 By the way, does the English language have a separate word for a female cat? 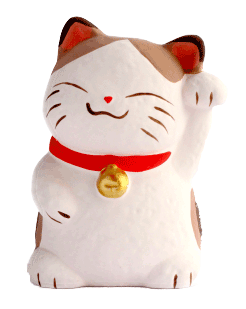 When I entered the Dutch words KAT (gender neutral), KATER (male) and POES (female) in google translate, it was rendered as CAT CAT CAT. I know a male cat is a tomcat. Is a female cat a puss? When I lived in Hilversum I hardly saw any, but in Kortenhoef we get a lot of feline visitors. The cat flap is in the kitchen door to the garden. There is a beautiful red tomcat that is very assertive and even gets angry when I put him out of our house. There is also a very smart and funny black-and-white cat we call Felix, who knows how to open the cat flap even when it is locked for incoming visitors, and there is a very cute grey cross-eyed cat. My cats are not happy with these intruders. Sometimes they just look with amazement from a distance at how a strange cat dares to gobble up their catfood, even Micah. But sometimes they engage in battle complete with flying cat fur and evict the intruders noisily. During the months without cats, neighbouring cats have claimed our garden. Different ones than some years ago. 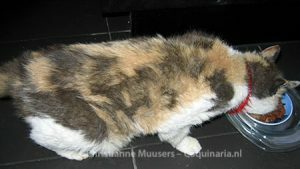 There is a new calico cat with a lot of white and very small ears (Scottish fold? 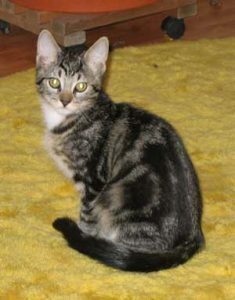 ), and a cat that somewhat resembles our cat Clio. That one appears to be a very good hunter, I saw it walk by one evening with a mouse in its mouth. A few days after their arrival, Luna and Milo were observed by her through the window, she appeared to be fascinated by them. I wonder what will happen once our cats may enter the garden in a few month’s time. 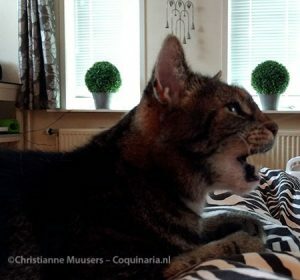 More cat pictures on Coquinaria: Poesjenel eats icecream, Poesjenel samples fish, City loves salmon, City also loves salmon trout, Clio samples Japanese cuisine, Hiro samples blancmange with crayfish, Hiro inspects a hedgehog, City inspects stockfish. 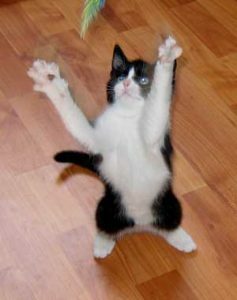 More cat pictures on FaceBook: Cat soup, Farewell City, Micah has gone, Hiro as spook, Hiro turns 8 years old. More on my cats on LiveJournal: Inscrutable Felines, First Mouse, My Brave Cats, Shameless Cats and Magpies, My biggest fan …, Refugee Cat, Family Extension, Update on Betje, My cat Poesjenel, Pleased to meet you, my name is Clio …, Cats and Brussels Sprouts, My new keyboard extension, Goodbye Betje, Kittens?, Kittens and Cookies, Portet van Hiro, Sad cat post, again …, New recipe (and new cat), Micah loves Sushi Day, Hiro loves paella, Vertical and horizontal cats, The most pigheaded cat ever, Scary Cat!, Dogged, Cats and doves, Finally!.